In Lesson One, students were introduced to general information to understand wildlife: the redefinition of wildlife, the concept of biodiversity, and to the general habitat needs of wildlife. Lesson Two examines more specifically forest structures and characteristics that contribute to wildlife habitat in a woodlot. This knowledge prepares the woodlot owner to recognize and to better protect or manipulate woodlot features that affect wildlife habitat. Forests in the Maritimes are part of the Acadian Forest Region. Prior to European settlement, and compared to today, the forests in Nova Scotia were much different. The forest contained a greater quantity of longer-lived and shade-tolerant tree species. No one, of course, can quantitatively describe this early forest; however, Carl refers to a report titled Old-growth forests in the Acadian Forest Region. The authors, with knowledge of ecological succession, geology, fire disturbance, and other information, project that 50 per cent of the Maritime landscape may have been dominated by late-successional old growth forest types. Land grant surveys made during the early days of European settlement support this projection. Bottomland Hardwood – Sugar Maple, Beech, Yellow Birch. It would not be accurate to imagine that a solid canopy of tall trees stretched across the whole province before European settlement. While there were more older trees than exist today, life did eventually end for the light-hogging forest giants. Natural disturbances—including windstorms, fire, ice, insects, and pathogens—created patterns of dead and renewing forests. Small canopy gaps, created by a falling tree or a group of trees, gave shade-tolerant understory trees the room and sunlight they needed to grow quickly and capture a place in the canopy. Larger openings gave mid-tolerant and shade intolerant tree species the chance to become established. The result was a highly varied forest, with different stages of succession, trees of all sizes and ages, and a variety of stand sizes and shapes. There were accumulations of woody debris on the forest floor. Standing trees offered many cavities for occupation by wildlife. At times, scattered tall pines or spruce poked above the canopy forming another layer called the supercanopy. Nova Scotia wildlife evolved amongst this forest mosaic for many thousands of years, and it is in this self-sustaining forest that habitat conditions are best for Nova Scotia wildlife. To manipulate wildlife habitat when managing woodlots, we look to lessons learned from the natural disturbance processes in Acadian forests. Habitat diversity means more wildlife. As explained in Lesson One, wildlife habitat must provide food, cover, and water, and have spatial arrangement. Some forest species find their niche within a single forest stand, but other wildlife might require a variety of forest stands. The more diverse the mix of forest stands, each with its own tree species composition, age structure, shape, and size, the more diverse the habitat opportunities are for associated plants and animals. To better understand woodland habitats, Carl asks the class to look at woodlot diversity from three perspectives: Looking Across, Looking Up, and Looking Down. Looking Across refers to horizontal diversity or diversity looking across the landscape. Looking Up refers to vertical diversity in a forest stand or the diversity from ground level to tree tops. Looking Up also includes the important component of cavity trees and snags. Looking Down refers to the important wildlife habitat of decaying logs. Looking down can also include the precautions taken to prevent soil erosion and nutrient loss. The study of wildlife habitat features continues in Lesson Three where a fourth perspective, Taking Care, is discussed, but more on that later. Carl talks about woodlot diversity that one sees looking across the landscape. Dan thinks about the view he sees if he takes the back road off the Cobequid Hills to his woodlot. At one point he can see the four woodlot features that Carl talked about. Dan can see the different types of forest tree communities—the different tree species groups of Hardwoods, Softwoods, and Mixed-woods. He can see that different stands in the tree associations have different ages—a reflection of past harvests and natural disturbance processes. He can see that each young and old stand has its own shape and size. He can see the arrangement of trees. Looking across the landscape the arrangement (or mosaic pattern) of forest types, forest ages, stand shapes and sizes, and the added inter-dispersed features such as watercourses or old fields, is a measure of diversity. The greater the forest mix, the greater are the opportunities for wildlife to find their appropriate niche. 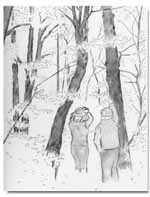 Trees were referred to in Lesson One as the giants of the forest. Trees dominate the lives of the other community members. Each of the province’s 10 native softwoods and 14 commercial hardwood trees has its own habitat preferences, yet often grow in combination with other tree species. Hemlock grows mostly in patches along rich north slopes and ravines or mixed with shade-tolerant trees such as red spruce and sugar maple. Balsam fir grows best on moist well-drained soils. Black spruce grows chiefly on poorly drained soils, but associates with balsam fir and white spruce on better soils. White birch prefers mineral soils and open sunlight. Nova Scotia has a natural diversity of forest communities. Different regions of Nova Scotia have different climate influences and different geological history, and this influences what forest types will grow. Coastal regions are foggy and temperatures are moderated. Interior areas are dryer and hotter. Some soils are glacial granitic soils and while others are sandy plains. The hardwood hills in Colchester County have a different forest, and a somewhat different wildlife population, than the fog-covered softwood forests along the coast of Guysbourgh County. The Department of Natural Resources has actually mapped regional differences in what is called an Ecological Land Classification. There are nine ecoregions for Nova Scotia. Ecoregions are further divided into ecodistricts. To learn more, see Ecological Land Classification in the references. For this lesson, it is enough to know that when trying to understand woodlot diversity, the location of a woodlot in Nova Scotia will reflect on resident plants and animals. Woodlot owners should recognize the influences of regional conditions and should manage the local native trees. Over time, these trees have the best-adapted genetics to the regional growing conditions. They should encourage shade-tolerant trees that once were dominant in their region. The obvious difference between coniferous trees and deciduous trees is the shape of their leaves and the year-long retention or seasonal loss of foliage. Generally, hardwoods support a richer diversity of life, but both have their benefits. Most softwoods are more shallow rooted and do not do not carry up minerals from deep in the earth. Conifer leaf litter is acidic and decomposes slowly, and hence limits the abundance especially of soil invertebrates. Softwood forests provide better winter cover for species such as deer and spruce grouse. Within predominately softwood forests, woodlot owners should retain some hardwood. 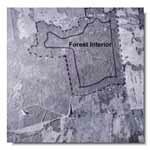 Similarly within hardwood forest, woodlot owners should retain some softwood. Mixedwood stands have the benefits of both tree types. 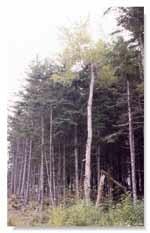 Sometimes a woodlot has small stands of less common tree species, for example red oak in northern Nova Scotia, a patch of eastern hemlock, black cherry on alluvial soils, or a rare species such as eastern cedar. Perhaps the woodlot once was an old farm and now has apple trees crowded by white spruce, an old field, or old-field alders. All these different parts add to the habitat variety of the woodlot and increase the opportunities that a larger number of wildlife species will find their habitat needs. Care must be taken not to eliminate these elements. Dan thinks of his woodlot because it once was a farm and has lots of old apple trees and fields grown up in alders. The seeds of maples, birches, ashes, and conifers provide important hard mast for small mammals and birds. Acorns of red oak are particularly rich in protein and fat. Red oak produces a heavy crop every two to five years, and trees begin peak production after 25 years. Beech used to be a very important source of beechnuts, but it now suffers from beech bark disease. Early nineteen-century farmer in western Nova Scotia on small farms corralled livestock under beech, and this practice illustrates the potential high food production of beech. In Maine beechnuts are a very important black bear food in fall. It is a shame that this tree has declined. Black cherry is an important large tree producer of soft mast. Mountain ash, serviceberry, chokecherry, pin cherry, and elderberries are other important soft mast examples. Herbaceous plants such as raspberries and blackberries are well known. Less known are fruits produced on plants such as false Solomon seal, wild strawberry, clintonia, painted and nodding trilliums, and many more. These quickly disappear as grouse and other wildlife feed across the forest floor. This section on mast has a similar theme to sections on Native Tree Species Composition and Keeping All the Parts. Woodlot owners should observe all the native plants that produce mast and find ways to encourage these plants. There is no need to introduce exotic berry plants. Introductions can sometimes go wrong by introducing invasive plants or pathogens. Taking clues from past natural disturbances of the forest, we do not suggest that woodlot owners set forest fires or import insect pests. Rather, when forest products are harvested from a woodlot, the harvest technique can potentially produce a balance of forest ages, create forest edge, and create a variety of stand shapes, and in a pattern that has good interdispersion. Carl explains that there is a change of thinking on the often-used clearcut harvest method that regenerates shade intolerant tree species. In years past, wildlife management was somewhat guided by an interest to manage deer. Clear-cuts were thought fine if lots of edge and a good representation of different successional stages were created. The trouble is that this even-aged harvest management approach often regenerates fewer long lived species. For specific tree species and site conditions, even-aged forest management still is a necessary practice. However, if conditions allow, a portion of woodlots should be managed to create unevenaged selection methods. Module Two of the Woodlot Home Study Course has a section on uneven-aged selection methods. Following a disturbance, forests re-grow. Initially the site is open with many herbaceous plants, such as raspberries. In 10 to 20 years, the new forest forms a thick canopy, and lush vegetation on the forest floor begins to thin and die out. In the next 20 to 80 years, subdominant trees in the canopy die and more light reaches the forest floor and plants can survive in the understory. As the forest ages even more, light reaches the forest floor and more plants invade and survive. Some wildlife species prefer the young forest and some the older forest. Some prefer different successional stages at different times. In fall and early winter, moose are found in young forests. In late winter, deeper snows force moose under mature softwoods. One challenge to integrating wildlife interest with forestry interest is that forests are now grown with shorter and shorter rotations. Sawmill technology allows use of smaller trees. It is perhaps not realistic to try to reproduce forests with ages as they were before European settlement, but there is concern that wildlife species that depend on old stands are suffering from a lack of habitat. Old growth forest is discussed further in Lessons Three and Five. Edge can be man-made or can occur naturally. A shoreline is a natural edge. The phenomenon of wildlife richness at edges is that wildlife has simultaneous access to two desired forest habitat types. Edges can take several shapes. Some are abrupt and others merge gradually. Some have high contrast and others less. Some edges are irregular and others straight. The forest edge created by the woodcutter shown in the picture is a man-made, abrupt, and high contrast edge. Carl explains that natural disturbances (mortality) in mature forests leave canopy openings with a variety of sizes and shapes. Most disturbances result from numerous scattered deaths of single trees. There are also many small patch disturbances of 0.1 to 0.8 hectare in size. Larger disturbances such as forest fires occur but less often. Some dominant forest types are more prone to whole stand replacing disturbances through fire and wind than others. Jack pine, for example, requires a fire for renewal. Surrounding each of these disturbance openings, whether small or large, there is edge. The creation of edge can be carried too far. It is possible to have a “see-through” woodlot made up entirely of edges. In the past when wildlife management focused largely on deer and snowshoe hare, it was a recommended practice to create diversity by artificially creating edges. This was great for edge and early succession species. However, another group of species, called forest interior species, were neglected by the edge/ succession approach. Edges are sunnier, warmer, windier, drier, and more exposed to major weather events. Some wildlife prefers or at least tolerates this exposure. There are more disturbances, such as roads and predators, at edges. Forest interiors, on the other hand, are sheltered and secluded. Within the damper interior, a greater abundance of insects and other invertebrates exist. Many bird species, such as thrushes, choose the interior as their niche: away from edges where predators prowl, they have better nesting success. Forest interior is habitat deep within woodlands and thus requires larger blocks of mature forest. This interior habitat is thought of as a “core” or “heart” of a forested block. It is a central portion separated by a distance of at least 100 metres from edges. Carl suggests a portion of a woodlot be managed as a larger block to maintain or create forest interior habitat, possibly by combining blocks using uneven-aged harvest selection methods. Larger blocks are also possible if neighbours combine stands along property lines. At the same time, other portions of a woodlot might have forest stands that require an even-aged harvest approach. Using both harvest techniques would provide habitat both for the species that prefer interior stands and vertical diversity and for the species that prefer edges and regenerating intolerant tree species. Vertical diversity refers to the extent to which plants are layered or stratified within a stand. Vertical diversity is probably of greatest importance to forest birds, although mammal species like red squirrel, fisher, and bats function in both horizontal and vertical dimensions. Joan is a bird watcher. As Carl explains vertical diversity to the class, she remembers a particularly active area for birds that she saw during a recent walk with Dan. She had tried to identify several bird species whose songs had caught her attention. She remembered how her view into the tree tops was obscured by several layers of vegetation. She heard the high-frequency calls of golden-crowned kinglets and finally spotted the active kinglet in the tree top. She saw a brown creeper working the lower tree trunks. Deeper into the shaded forest floor, she heard an ovenbird’s territorial song. Joan realizes that she has seen the benefits of vertical forest diversity first hand. A stand with a high degree of vertical diversity characteristically has multiple vegetative layers. A highly developed, uneven-aged, deciduous forest could have four layers. There is a canopy of dominate or codominate trees. Beneath this are a lower tree canopy, then a shrub layer, and a ground layer of herbs, mosses, and ferns. Any supercanopy tall pine above the hardwoods canopy adds a fifth layer. Stratification is less in softwood forests than hardwoods, except where the upper canopy is opened through age and natural mortality or by uneven age harvest. Spruces and balsam fir also have spiral-like crowns that create a fairly open canopy near the tops of the trees. Further down the tree the dense canopy tapers out and comes together. In the higher open canopy, birds can hunt amongst the boughs or “hawk” for flying insects in the open space between trees, like cedar waxwings and flycatchers do. Vertical diversity is usually lacking in early and mid successional stages. Carl earlier expressed a concern for the decreasing amount of older forests. It is not until later successional stages that vertical diversity develops. A pileated woodpecker peers out from a tree cavity. Cavity trees, simply stated, are nature’s birdhouses. Cavity trees are live, partly live, or dead trees. They have sufficient diameter that woodpeckers can excavate cavities and have enough space within the tree trunk to lay eggs and fledge young. A cavity might occur in a tree without a woodpecker’s help, through a combination of injury to a tree and decay. Snags are trees that are partly alive or no longer alive. The terms snag, wildlife tree, and cavity tree overlap somewhat in meaning. Snags provide perches and are likely to develop cavities. The more valuable snags are those with larger diameters and thus have the potential to provide larger animals with nest, den, or feeding opportunities and later will persist longer as fallen logs. For a long time the significance of cavity trees for wildlife was unappreciated by biologists. It is now known that about 25 per cent of our forest birds and mammals require cavity trees. Cavity trees are used by a succession of species, for perches, nest and roost holes, dens, and foraging sites. Use continues by another assemblage of wildlife as the log falls down and rots away. Woodpeckers are termed primary excavators and are responsible for the majority of “bird house” openings that we see on trees. The woodpeckers chisel out new cavities each nesting season. In the following years the cavities are available to secondary nesters, such as chickadee, nuthatch, saw-whet owls, kestrels, tree swallows, or flying squirrels. Chickadees and nuthatches will dig out their own cavities if the wood is soft. 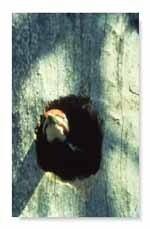 Larger tree cavities are made by pileated woodpeckers or can result from tree injuries that gradually become larger by decay. The larger cavities become dens and nest sites for larger species, such as marten, fisher, raccoon, and barred owl. A conk is evidence that decay has entered a tree. Such trees become good cavity trees. If a tree suffers an injury, decay-causing fungi enter and become established in the tree. The tree responds by forming a firm boundary to contain the infection. The barrier zone is the tree's defence in separating older infected wood from new wood that forms. If a tree is 10 cm when injured, the greatest diameter of decayed wood will be 10 cm—about the right diameter for excavation by a Downy Woodpecker. Woodpeckers recognize trees with decayed centres and excavate through sound wood to create nesting cavities. Conks are a means by which humans can recognize an infected tree. Old loggers had the notion that fallen and rotting trees within the forest were a wasted product. Thinking has changed. Forest ecologists use the term coarse woody debris for this material, and a quantity of this material on the forest floor is vital for forest diversity. Downed woody material is used for nesting and cover, as a source of and a place to store food, as lookout, drumming, sunning, and preening sites, and as natural bridges across openings and streams. Large logs are particularly valuable and persist longer. Large logs with hollow portions may be used as dens by larger mammals. As a log decays and settles, there is a change in occupants. As decay advances, the log becomes more important as a habitat for tunneling invertebrates and small mammals. The logs over time absorb moisture and become inhabited by amphibians. The red-backed salamander lays eggs amid the moisture of decayed logs and does not need to return to ponds to breed like most amphibians. In addition to providing wildlife habitat, downed woody material is nursery for regenerating trees and understory plants. Woodlot owners that appreciate wildlife and biodiversity need to look at their ownership in the three perspectives—across, up, and down, that Carl describes. Having healthy and diverse habitats is the foundation for diverse wildlife populations.